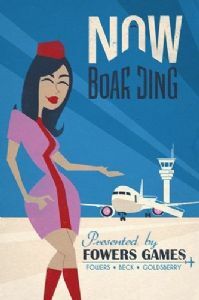 Now Boarding is a real-time cooperative game in which you work together to fly a fleet of airplanes. You must to deliver all the passengers to their destinations before they get too angry — and new passengers are constantly arriving! Upgrade your plane to fly faster and carry more passengers to handle the load. The twist: All players take all their turns at the same time! This allows for clever hand-offs of passengers. It's a whole new level of pick-up-and-deliver game.